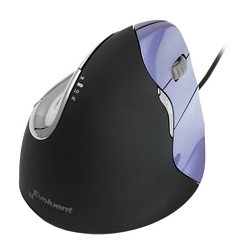 The Evoluent VerticalMouse 4 supports your right hand in a relaxed neutral position as if you're reaching out to shake someone's hand. The grip is the same as with an ordinary mouse... simply turned sideways. The buttons are operated by the same fingers so virtually no retraining is necessary. For right hands less than 7 in. (178mm) from tip of middle finger to wrist crease. Includes software on CD-ROM. Requires Microsoft Windows XP/Vista+.